Skibbereen Theatre Society members are hitting the 2012 drama festival circuit, competing in the confined section with their production of Billy Roche’s Poor Beast in the Rain. Wexford are in the All-Ireland hurling final in the late 1970s and the anticipation is palpable at the local betting shop. Georgie and Joe, men who spend a lot of time in the shop (albeit for very different reasons) chat with Eileen, the feisty daughter of owner Steven. Georgie is clearly besotted with Eileen. Joe, middle-aged, dispenses much advice to his younger cohort, most of it based on his own experiences as a wild youngster, when he and partner-in-crime Danger Doyle were the local hotshots. Eileen, Joe, and Georgie all endure sarcastic barbs from cleaner, Molly, who was once Doyle’s girlfriend and has little time for the romantic picture still painted of his exploits. Ten years earlier, he left Wexford, taking the boat to England with Eileen’s mother and leaving friends, lovers, and a jilted husband behind. As excitement about the match reaches fever pitch, Danger Doyle comes home. Poor Beast in the Rain, is the middle part of Billy Roche’s Wexford Trilogy. The Skibb group finished second in the All-Ireland Confined Drama Final in 2005 with another Roche play, The Cavalcaders. 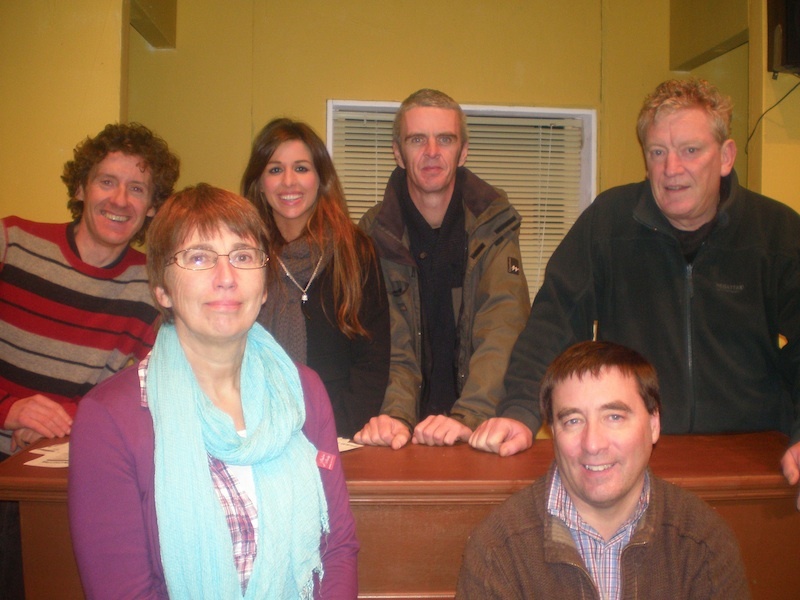 The cast of Skibbereen Theatre Society’s 2012 production of Billy Roche’s Poor Beast in the Rain – front, from left – Carmel O’Driscoll and Eugene McCarthy. Back: Micheál Hurley, Sarah Murphy, Declan McCarthy and Donagh Long.